Nam Lee Pressed Metal Industries (Nam Lee) is an established metal fabricator dealing in aluminium and steel products. Nam Lee remains the only worldwide third-party manufacturer of aluminium frames for container refrigeration units in the world for a major customer. Nam Lee’s range of other aluminium and steel products includes gates, door frames, staircase nosing and hand-railings, sliding windows, grilles, laundry racks and letter boxes for flats and houses. 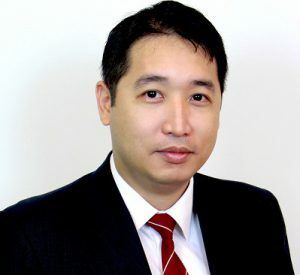 Nam Lee was listed on the Singapore Exchange on 26 October 1999 through 12,000,000 Offer Shares at S$0.42 each, and 35,500,000 Placement Shares also at S$0.42 each. Nam Lee is currently trading at 0.71x trailing price-to-book (P/B) multiple and we estimate rolling next-twelve-months (NTM) forward price-to-earnings (P/E) multiple to be only 6.9x, versus peer trailing average of 13.1x. As of end-June 2016, net current asset (NCAV) per share of Nam Lee was 36.2 cents. Net current asset value is defined as total current assets, less total liabilities. It conservatively assumes that non-current assets do not have any salvage value, and only current assets are used to pay off both current and non-current liabilities. At its last close price of 37.0 cents, the stock price is just 2.2% above its NCAV. While year-to-date (YTD) 9MFY16 revenue is 14.7% lower year-on-year (yoy), profit after tax and minority interests (PATMI) has grown 14.6% yoy. Nam Lee had renewed its contract with its major customer two years ago at better pricing, which led to the expansion in gross margin. The benefits have largely been able to flow through to the bottom line. 3QFY16 was particularly weak in terms of yoy revenue growth, and we are erring on the side of conservatism to forecast a weaker 4QFY16 as well. This results in a weaker FY16F PATMI being 4.1% lower yoy, but with better margins mitigating the 12.7% lower yoy revenue. We see Nam Lee’s cash hoard growing in FY16F due to the higher free cash flow. The higher free cash flow arises from three factors: higher profit (compared to historical average), better working capital management and lower capital expenditure (CapEx). We expect positive net change in cash of about S$12mn from S$38.4mn at the start of FY16F. 2.5 cents dividend was declared for FY15, equivalent to S$6.0mn cash paid as dividends. We see Nam Lee generating positive net cash flow from operations in the mid-teens range, under normalised conditions. We estimate 5.14 cents EPS for FY16F and 3.5 cents dividends per share (DPS) (1.0 cent ordinary and 2.5 cents special) to be declared. This translates to an implied forward dividend yield of 9.5%, based on last closing price. We opine that Nam Lee has been neglected by the market and is currently trading at a significant discount to what it is truly worth. It is currently priced just 2.2% above its NCAV and this will serve as a price floor for investors, limiting adverse downside price movement. Notwithstanding the potential 86% capital gains, we view the DPS of 3.5 cents as sustainable, and the dividend yield of 9.5% is highly attractive. High-conviction “BUY”. Unbeknown to the broader general market, there has been a re-rating catalyst for the stock. Nam Lee had successfully re-negotiated its contract with its major customer (Carrier Refrigeration Singapore Pte Ltd) for another five years at better margins. We believe that the previous contract had expired around end-2013 and was renewed in 1H-2014. 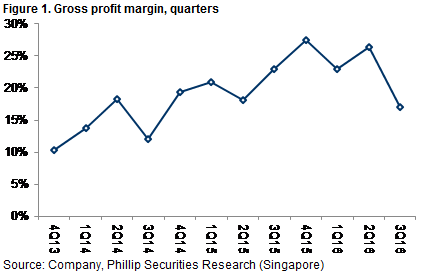 Consequently, gross margin has been on an improving trend since 3QFY14 (fiscal year-end September). Our channel checks suggest that Nam Lee is able to pass on the raw material cost (aluminium) to its customer. Hence, Nam Lee is not exposed to fluctuation in aluminium price. 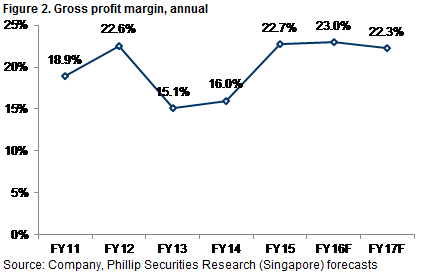 Nam Lee’s gross profit margin does not hold steady quarter-on-quarter (qoq) due to the nature of the contribution from project-based products. On a full year basis, we are forecasting gross profit margin to sustain at low-twenties. Nam Lee’s speciality product is aluminium frames used for container refrigeration units, which are more commonly known as “reefers”. Reefers are used to transport perishable food. Demand for reefers and trade routes are non-cyclical with the underlying demand drivers of population growth and desire for fresh food. Detailed and accurate information on global reefer trade volumes is not available because only the carriers themselves have the data for their own operations and do not share it. However, according to a leading maritime research house, the main trade routes are bananas and pineapples shipped out of Latin-America, meat and dairy shipped out from Australasia, and intra-Asia movement of seafood, dragon fruit, garlic, durians, apples and pears. The next growth market for reefer could be the shipping of pharmaceuticals. Nam Lee’s involvement in construction projects spans across both the public and private sectors. According to data from the Building & Construction Authority (BCA) of Singapore, there is a steady pipeline for construction demand all the way to 2020. Net current asset value (NCAV) is one method of ascribing a liquidation value to a company. The NCAV of a company is the value of its total current assets, less its total liabilities. It conservatively assumes that all non-current assets are impaired to zero value, and total liabilities are paid from only the current assets. Looking at the NCAV of a company is a more conservative metric than the net asset value (NAV). We believe that market concerns over Nam Lee’s customer concentration risk (from the contract for aluminium frames for container refrigeration units) have been an overhang for the share price. While the market concerns are valid, they are overblown, in our view. Nam Lee has a long standing relationship with its customer and Nam Lee’s economic moat stems from the switching cost for its customer. We opine that it is irrational for the stock to trade at a distressed level that is below its NCAV. With us highlighting Nam Lee’s NCAV, we believe that that there will now be a price floor at that level. Going forward, we expect Nam Lee to consistently report at least a low double-digit full year PATMI. With the higher PATMI (compared to historical average) coupled with the lower CapEx, we see sustainable growth in cash on the balance sheet. We think that higher dividends should be sustainable.